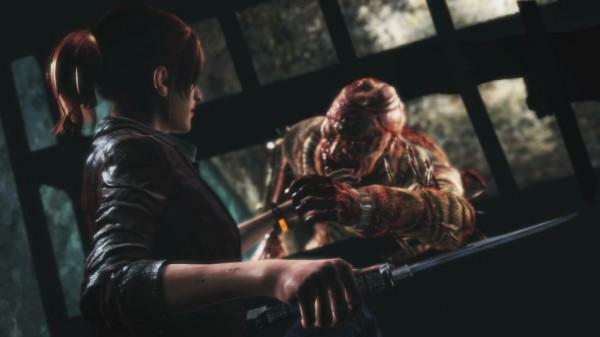 Resident Evil Revelations 2 was one of the high profile games at Tokyo Game Show 2014 this past weekend. Capcom is looking to recreate the critical success of Resident Evil Revelations HD, and many are wondering if they can nail the balance between older scary Resident Evil and newer action packed Resident Evil once again. Capcom took to the big stage at the conference, and gave a demonstration of the new game. Our presenter speaks in Japanese, but the characters' voices are in English. Lead characters Claire Redfield and Moira Burton explore the dark prison they wake up in. Claustrophobic corridors, dark corners with surprises around each corner, bloody operating rooms and cramped jail cells. Atmospheric enough for you? It doesn't take long before the fun starts and Claire and Moira get bombarded by the infected. They pop from everywhere. Shelves, doors, shadows. Moira does little to help because of her fear of firearms, but thanks to the modern over-the-shoulder combat, Claire is able to drop zombies far more effectively than she was able to in Resident Evil 2. My own impressions from the game were tainted with confusion over the nomenclature of the axes (X vs Y), but once I finally got them to work properly, it was a fun game. I'm not ready to set it up on the same level as Resident Evil Revelations HD after just ten minutes, but I think it has the basics down to get there with proper pacing. No release date yet, but Capcom has confirmed that this will be an episodic game with four episodes releasing over the month of its availability. Each with be priced at $5.99, and a season pass will be $24.99. A packaged version is also scheduled to be released with extra content for $39.99.